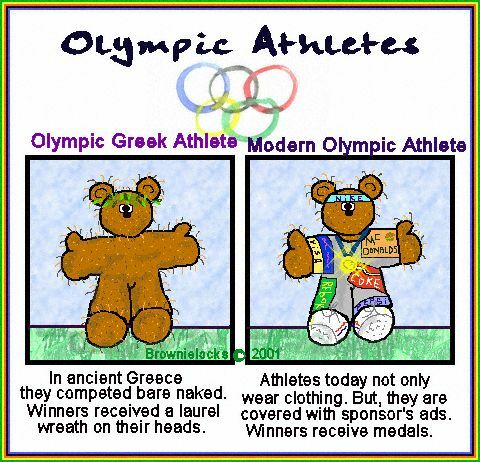 Another Olympic cartoon from our Weekly Cartoon Series. Since the Olympic games go way back to the early Greeks, to do an entire history on one page is a bit overwhelming. So, I'll give you a brief summation of how it all began, and a few other fun facts. So, how and why did it all begin? It was the last one, the Olympics, that were held for the Greek God Zeus and were also the most popular with the people. The first game is said to be held at Olympia, Greece in 776 B.C. and has been held every 4 years since = 1,168 years! Then, Greece came under the rule of the Roman Empire and the Olympic games were declined, to the point where they actually declined in 393 B.C. by the Christian Roman Emperor, Theodosius I, who objected to what he felt were some "pagan rites" associated with the games. In the beginning, the Olympic games were confined to just one day and one event. That event was a footrace that was the length of the stadium. Soon, additional races were added as the popularity grew, as well as discus and javelin throws (tosses), broad jumps, boxing, wrestling, chariot racing and a pentathlon. The pentathlon was composed of 5 different track and field competitions. I guess for those who weren't so physically athletic, they also included competitions for poetry, dramatists and orators. Soon, the length of the games extended to 5 days and the winners (often like today) were celebrated and considered national and local heroes. Baron Pierre de Coubertin of France, and educator and scholar wanted to discourage professionalism in sports by holding amateur world championships. As a result, he's the one who is credited with reviving the Olympics as we know them today around the late 19th century. The first Olympiad of modern times was held under the King of Greece in 1896 in a new stadium built for the purpose of Athens. Since that time, the games have been held in cities all over the world at 4-year intervals, with an exceptional lapse during World War I and World War II. The Olympics were all men until the 1900 Paris games. There were 997 atheletes competing and out of that only 22 were women who participated in five sports: tennis, sailing, croquet, equestrianism and golf. It wasn't until 1924 when the Olympics became seasonally separated into the Winter Olympics and the Summer Olympics. Today's modern Olympics are normally set at resorts for the Winter games and in large cities for the Summer games. And to help hosting cities prepare, in 1994 the 4-year cycle became split where the games were 2 years apart between the seasons. An example is: Winter Games in 1994 and and 1998, but the Summer Games in 1996 and 2000. The Summer Olympic Games have right now 23 approved sports including archery, basketball, boxing, conoeing, cycling, equestrian, fencing, football (aka soccer), gymnastics, modern pentathlon, rowing, swimming, diving, volleyball, water polo, weight lifting, wrestling, and yachting. The newest summer sport of synchronized swimming was added due to popular demand. The Winter Games include biathlon (skiing and shooting), bobsledding, ice hockey, luge, ice skating (figure and speed). During the last winter Olympics in 1998, winter snowboarding was accepted as an official winter competition. About 160 countries compete and send thousands of athletes (male and female) to the Summer Olympics. The Winter Olympics are smaller as far as nations sending athletes. They have about 60 countries that participate. Countries that have an environment that fits a sport usually dominates a sport. But sometimes a country will challenge traditions. One good example was the Jamaican Bobsled team. Although it had no snow to practice, and it came in last, it won the hearts of the world with it's sincere efforts. Television (and especially color!) has increased the popularity of the Olympics worldwide. And in some ways has also been the cause of it's commercialism that some complain about, often resulting in what some consider "prejudicial judging" because the common pattern is that only the medal winners (esp. those with the Gold) get offers for commercial product endorsements and potential financial earning power in their futures. The Olympic Motto was created in 1894 by Baron Pierre de Coubertin. In Latin it is: Ciius, Altius, Fortium. Translated it means: Faster, Higher, Stonger. It was first introduced to the world in 1924 at the Olympic games in Paris, France. Another motto that was adopted earlier in 1908 was taken from a serom by a Bishop from Pennsylvania during the Olympic games in London. "The most important thing is not to win, but to take part." The continents. But, we have 7 and there are only 5 rings. Duh? This symbol was created in 1912 by Baron Pierre de Coubertin who is the co-founder of the modern Olympic Games. By his definition, there were 5 continents who participated in the Olympics: Asia, Africa, Americas (North & South), Europe and Oceana (Australia/New Zealand). The colors of the rings are blue, red, yellow, green and black, along with the white background of the flag they were on, represented all the colors that appeared in all the flags of the countries that participated at that time. A flag did not have to have "all" the colors; but, at least one of the colors were represented. For example: The US flag is red, white and blue. So, red and blue are in the circles, with the white as the background of the Olympic flag with the rings on it. The actual Olympic flag with the white background and 5 colored rings was created in 1914. The images on these coins have changed through the years because each hosting country designs them. (Like the style of the torch changes as well.) Guiseppe Cassioli designed the image of Nike (Goddess of Victory) to be put on the obverse side of the Medal. This remained from 1928 to 2000. However, in 2004, an updated version was created by Elana Votsi, a jewelry designer, to have a more Greek representation by having Nike flying into the panathegenic stadium to represent renewal of the games. Since 1949, even those that came in 4th, 5th and 6th got something. Although it wasn't a medal, they got an official Olympic diploma. Then in 1989, they also started giving this diploma to 7th and 8th place finishers as well. It's not just about the medals. The athletes also get money based on the medal they win. How much depends on the country they represent. The US basically pays $25,000 for Gold, $15,000 for Silver and $10,000 for Bronze. This was not tax free until the 2018 Olympics. Olympic Gold Medalist Shaun White, who won a Gold Medal in Pyeongchang, S. Korea will now take home $37,500 for his Gold Medal. This is a 25% increase since the Rio Games and currently is the highest US prize money the US Olympic Committee has ever awarded (so far.) And, thanks to Senator Charles Schumer's bill making Olympic earnings now tax-free, he gets to keep all the money. So do all the other US athletes who also win Gold, Silver or Bronze. There used to be one. It is based on the Roman salute. But, it looks so much like the German Nazi salute it has been stopped since WWII. They're fairly new. They first started in the Winter Olympics in Grenoble, France in 1968. It was a little man on skis and it was named "Schuss." The mascot is usually an animal that is custom to the hosting country; or a human figure that represents the cultural history of the country. One of the most popular animal mascots was the 1980 Olympic Soviet Bear named "Mischa." One of the most mis-understood or confusing Olympic mascot was for the 1992 Winter Olympics in Albertville, France. The mascot was a man-star with a cube named "Magique." It was suppose to symbolize dreams and imagination and many could not relate that to France or even the Olympics. Yes, the Olympics have an anthem. But, the song that you hear on US TV for every Olympic (Summer and Winter) was originally written in 1984 by composer John Williams for the Los Angeles Summer Olympics. It's known for the drums and trumpets and is called "Olympic Fanfare" and done along with "Bugler's Dream." During the 1984 Los Angeles Olympics I had the unique pleasure of actually having the torch run right in front of my office building when I worked in Goleta, California (it came down Hollister Avenue). The torch was as close as 5 feet from me. Although I did not recognize the runner during this section of the lap, I saw the torch! If you ever have a chance, I recommend you do also. It's a once in a lifetime experience. Both the Summer and Winter Olympics open and close with ceremonies. The peak of each ceremony is the lighting of the Olympic flame and the putting out of the flame. The Olympic Flame is said to represent the "Olympic Spirit" of competition. In the beginning, a cross-country runner would light the torch at Olympia, Greece and then carries the ignited torch with it's burning flame throughout the 15 days of the game. Thousands of runners representing each country between Greece (the home of the Olympics) and the current host country participate in this 4-week torch relay. The newest tradition, which began with the summer Olympics in Los Angeles, CA (USA) was to have the torch carried across the country by people from all walks of life and have it arrive at the stadium just in time for the opening ceremonies. Who lights the Olympic Flame is often kept a secret until the final moment. The same goes for who puts it out. But the lighting of the flame is then followed by a really gala celebration of fireworks, musical entertainment, dance and large production numbers, as well as a parade of the nations and all it's competing athletes. There are several groups that have wanted a certain game as part of the Olympics. I think ballroom dancing is one. But, believe it or not, we have had a few rather interesting competitions in the past. Most of them have not stayed very long. Some are still around. This first appeared at the 1904 games. The competitor stands up straight and holds a pin in each hand. These look somewhat like bowling pins. Then he twirls and whirls them into a routine, gaining points for each move. The more difficult, the more points. However, this isn't like juggling. The clubs NEVER leave the competitor's hands. Some say this preceded rhythmic gymnastics, that uses ribbons and hoops. This event was only in two summer Olympics, ending in 1932. But, the US always won in this event. In fact, in 1932, the Great Depression was going on. And, that year's winner, George Roth was unemployed. After he was awarded his medal, he then hitchhiked home. This was held in 1904. It was the only year it was held. The event included ten different lifts held over two days. The winner was Oscar Osthoff of the US, who was also a strongman. Can you imagine two athletes whacking canes at one another? Well, this is what this sport was. It's like fencing, only I guess a little safer since you're not dealing with any sharp swords. This first appeared in the 1924 summer Olympics. I think that was its only year? Yikes! This first appeared at the 1900 summer Olympic games. The goal was to shoot down as many live pigeons as you can. The winner of the Gold Medal shot down close to 300 birds. Can you imagine what a bloody, feathery mess they ended up with by the time this was over? Fortunately, this was the only year this contest was in an Olympic game. What were they thinking? This is a tricky athletic event where competitors try to outrace each other with fast walking but not actually running. In order to make sure this is walking and not running, the athlete has to always have one of his feet on the ground at all times. This creates a really wiggly, fast walk and looks a little silly. This even began at the 1904 summer Olympics. And, guess what? They still have it! Think ice hocky only on roller skates. This started at the 1992 summer Olympics in Barcelona. Agentina took the Gold Medal for this. It was never featured again. What? Sounds like an oxymoron doesn't it? This debuted in 1984 at the summer Olympic games in Los Angeles. And, Tracie Ruiz of the U.S. won the Gold! Apparently, in this competition the swimmer must be in total synch with the music and performs a water ballet. This event lasted until 1992 and then it was dropped. This event began in 1906 where male athletes threw a 14 lb. stone from any position they wanted to. ( The shot put is thrown from the neck position only. ) At the time, they also had the shot put contest too. But, decided to drop stone throwing and just have the shot put. Greece won the Gold and Bronze. The US won Silver. This was the only year for this contest. This contest began at the 1900 summer Olympics in Paris. The swimmers had to not only swim 200 meters, but also crawl over boats, swim under boats and climb a pole in the Seine River. I think this was the only year for this event. Maybe because not all cities that held the summer Olympics had a river? This began in 1906 and was dropped. Then began again in 1920-1972. It was a 2000 meter sprint. This biking race never really had a lot of competitors. But, it hasn't gone away. It's now a part of the Paralympic Games. Bouncy! Bouncy! This event began at the 2000 summer Olympic games and competitors have to flip, bounce, somersault, etc. in a routine for the judges that are carefully watching for perfect body control, difficulty of the routine, execution skills and height and time in the air. This event is still being held today. I'm not sure when this began. Perhaps since the very first Olympic games in Greece? But, this is a team event (not individual) in which the athletes compete to pull a rope past a marked spot. Great Britain has won this contest more than any other country until it was cancelled in 1920. Would you believe we once had an event to see who could hold their breath underwater the longest? The event was held only once, at the Paris summer Olympics in 1900. It didn't really attract a lot of spectators. I guess watching it would be difficult back then. Perhaps it would more popular today because we now have underwater cameras. The event was 60 meters long, and the swimmer got awarded 2 pts. for every meter he swam under water. Plus, one additional point for each minute they stayed under the water. The winner was Charles DeVandeville (France), who swam 60 meters in one minute and 8.4 seconds giving him a score of 188.4 pts. Ironically, Peter Lykkeberg, who came in third, actually swam for nearly 30 seconds longer than the DeVandeville. But, he swam in a circle, so he didn't get the distance needed in points to win the Gold. Source: "Holiday Symbols, 2nd Edition"